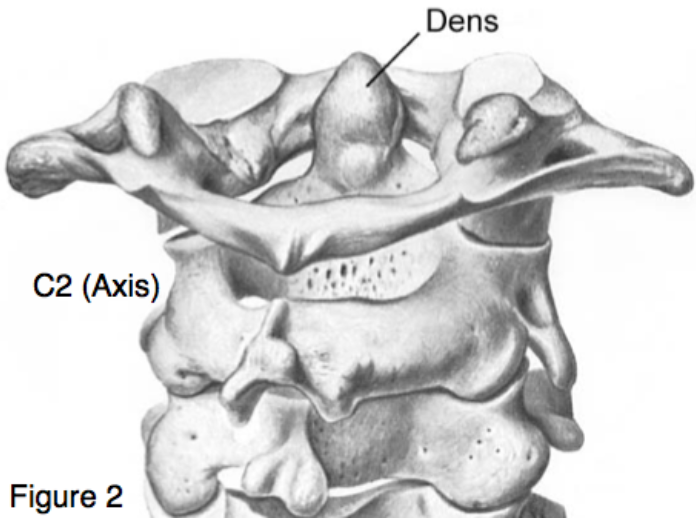 C1 (Atlas) (Figure 1)- Specialized cervical vertebra devoid of a vertebral body, in its stead is the dens of C2. C1 ring is composed of an anterior arch, lateral masses, and posterior arch. The lateral masses contain the superior and inferior articular facets that articulate with the occipital condyles and C2. The transverse processes project from the lateral masses.The C1 articulation with the occiput allows flexion and extension of the head. arch of C1. 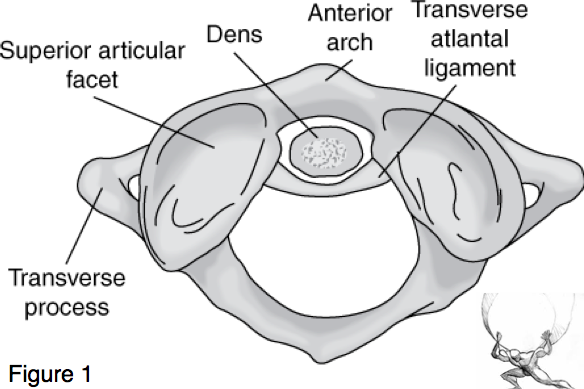 The transverse atlantal ligament (TAL) holds the dens in place against the anterior arch of C1. The C1-C2 articulation allows the head to rotate from side to side. 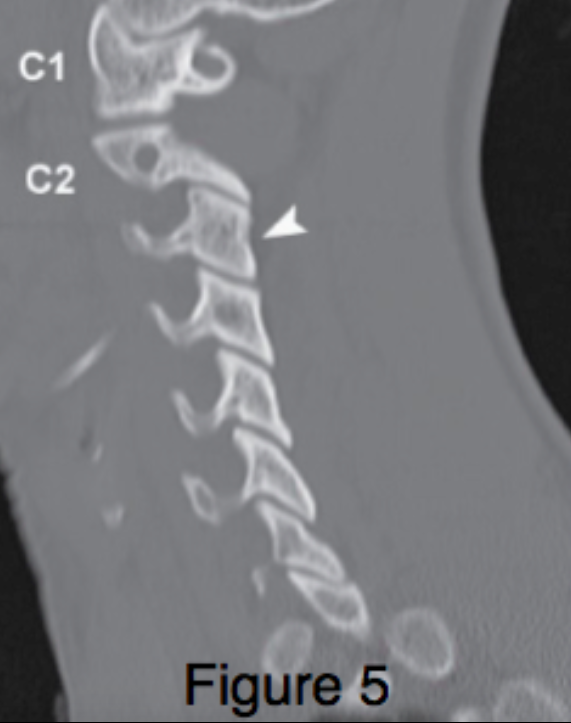 C3 to C7 (Figure 3) – The vertebral body connects to the lateral masses by the pedicles. The laminae connect the lateral masses to the spinous process. The pedicles, lateral masses and the lamina form the posterior (neural) arch. 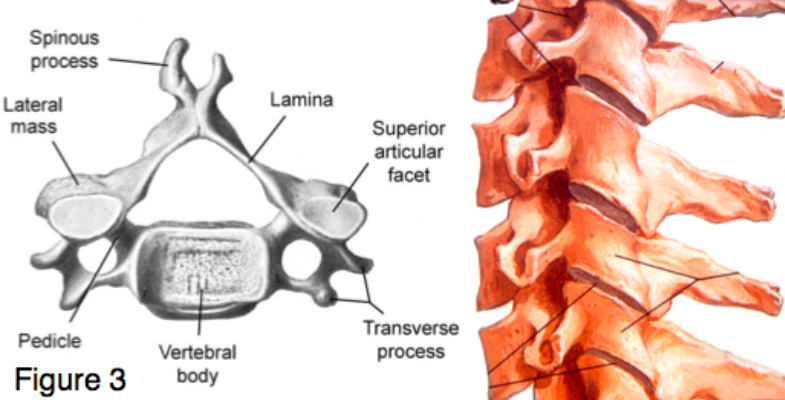 The superior and inferior articular facets of the lateral masses articulate with the facets of the adjacent vertebrae. The transverse processes project laterally from each pedicle. Look first at the midsagittal slice, then scroll through the sagittal slices. 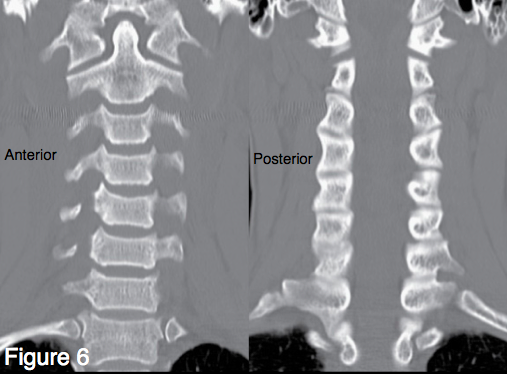 Next, view the coronal slices from anterior to posterior looking at C1-C2 (cervicocranium) and the lower cervical vertebrae. 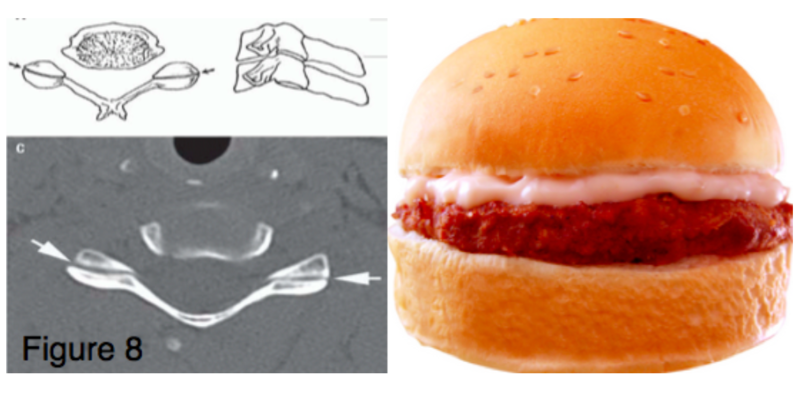 Finally, review the axial images from the occiput and C1 to C7 and T1. 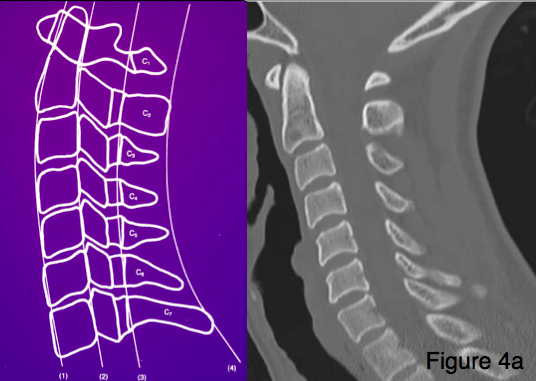 A = Alignment (Figure 4a): 4 smooth curves are formed by the anterior and posterior surfaces of the vertebral bodies, and the bases and tips of the spinous processes. These are best evaluated on the mid-sagittal view. B = Bones: Assess each bone in sagittal, coronal and axial views. C = Cartilage: Assess the spaces between each vertebra, specifically looking for widening, narrowing or asymmetry. Pre-dental space (between dens and anterior arch of C1) maintained by the transverse atlantal ligament. 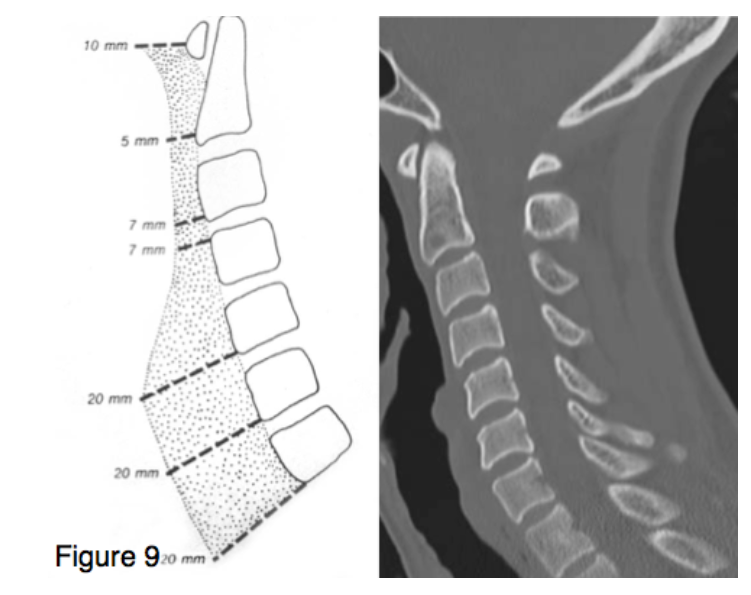 S = Soft tissue (Figure 9)-Examine the pre-vertebral soft tissues in the mid-sagittal slice. The esophagus is interposed within the prevertebral soft tissues starting at C4-C5 so soft tissue thickening is a less reliable sign of injury.